In Winning Putt players get the chance to step onto the golf course as an aspiring professional golfer, able to choose from three different classes that determines how much Power, Accuracy or Balance they have with their shots. Players will compete in friendly or tournament matches and complete quests that give XP, currency and a variety of items to help them on their journey. 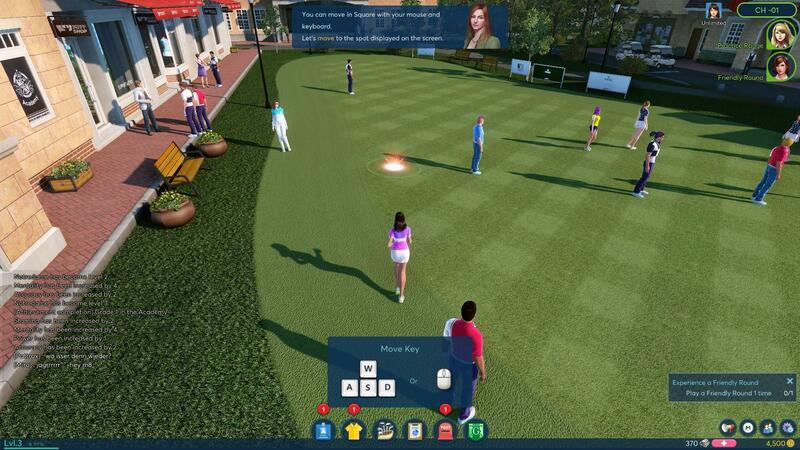 With numerous golf courses, game modes, features and social community focuses aspects the game brings the MMO vibe to a golf simulator title. To start players get to choose from three classes, Power based who can drive further due to the extend run on the ball when it lands, Accuracy that makes it easier to place your shot without slicing, and Balanced that finds middle ground between the two. 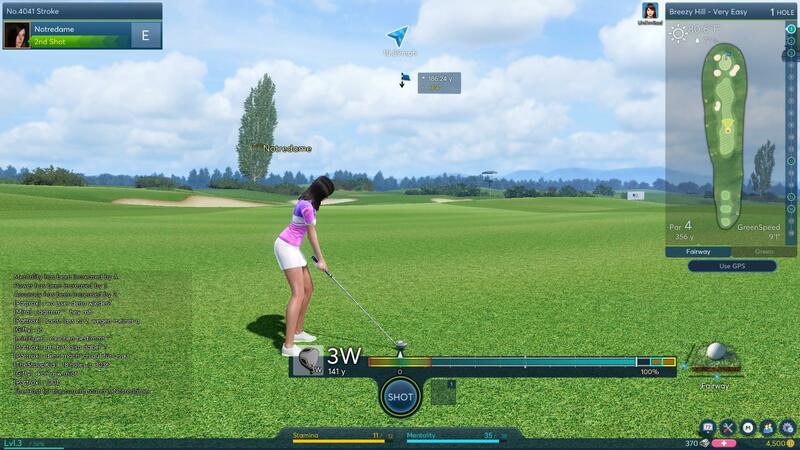 Players get to improve their stats and skills through skill training, including other elements such as increasing their Stamina and Mentality; both of these increase and decrease throughout a game depending on how a player performs, taking lots of powerful shots or getting stuck in rough areas will sap a characters Stamina over the course of a match making it harder for them to hit at their full strength in later rounds. More dangerous is the Mentality, when a players messes up shots and ends up well over par (the average number of shots it should take to complete a hole) then their Mentality goes down making it harder to be as accurate and subsequently missing more shots. Taking shots revolves around stopping an arrow moving along a power gauge, trying to stop it at the end of the gauge for max power (or earlier if they want to pull their shot slightly) and stopping it too late will overpower a shot decreasing accuracy. Once the power is determined the arrows moved back down the gauge and players must then stop it in a thin line, the closer to the line they get it the more accurate the shot to land where they originally aimed; stopping it slightly too late or too early will pull the shot and have the ball drift to the left or right, stopping it very late or early will completely slice the shot! 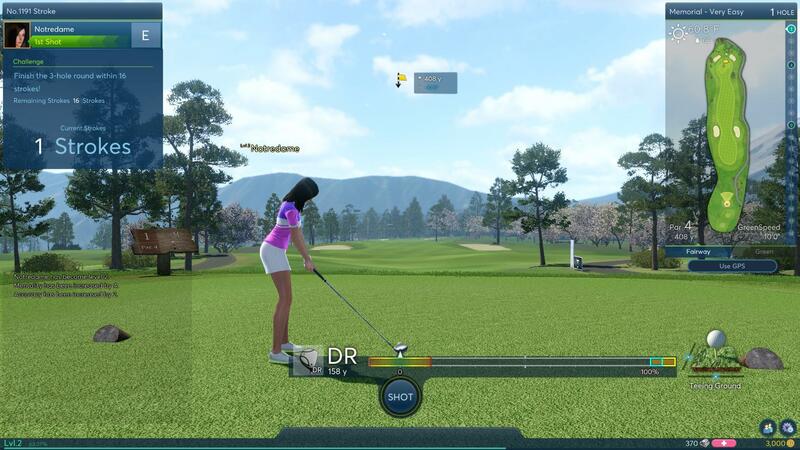 On the green players must also learn how to read the terrain grid, a grid overlay that shows which way the terrain flows with hills and dips, choosing their aim and determining the power of their shot. As well as mechanical stat increases and player skill with stopping the arrow on the gauge, players can mitigate the required skill through various items and gear, such as consumables to improve performance temporarily or gear which increases stats, power, accuracy and more. This gear comes in different levels of quality (white gear, green gear and blue gear) with better stats the higher the quality; this gear can be earned through quests, purchased with Premium currency for a random chance at getting high quality items, or upgraded through the Enchantment NPC by using components to modify it.